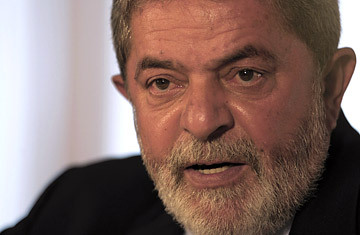 Brazilian President Luiz Inacio Lula Da Silva. TIME: As a leftist, global investors feared your 2002 election, but you stuck to economic orthodoxy. Is that why your presidency has been such a success? Lula:It has to do with first of all maintaining stability, then controlling inflation, diversifying our exports, increasing the buying power and minimum wages of workers and a development policy designed to strengthen national industry. Our idea has always been one of balance; when it comes to the economy there is no magic. We can't do things with the academicism of economists. I believe implicitly that Brazil has found its way. TIME: But few if any Latin American governments have been able to balance market and social justice principles. How did Brazil? Lula:We have lots of people in this government who came from social movements, so we are putting into practice the kind of things we were demanding when we were [in the opposition]. We firmly believe that it's important to distribute wealth in order to grow, rather than wait for growth to distribute wealth, as people said for decades. I was afraid of a second term. [But now] I am convinced that Brazil will be one of the six biggest economies in the world within 10 years. We are more than capable of that, and with the discovery of the oil our future is a bit more guaranteed. TIME: Just how many billions of barrels of oil did Brazil really find? Lula:We don't have certification of that yet. All I can guarantee you is that Brazil will now be among the biggest producers of oil and gas in the world. TIME: Will you create a new, state-run oil company to manage it all? Lula:There is no new company. I created an inter-ministerial group, and they are going to present a proposal I intend to discuss with the Brazilian people. All I've said is that we won't export the crude oil  I want to export refined oil and derived products  and a part of the money will go to education and fighting poverty. We have a historic debt to settle concerning education. TIME: Despite your investment, the quality of education in Brazil is still considered very poor. Lula:We are investing $28 billion in education. We have [computer] labs in all our technical schools, and between now and 2010 every urban school will have broadband access. So really, deep down we are revolutionizing education. TIME: When we speak of your legacy, which will be more important  the fact that Brazil next year will start work on the hemisphere's first bullet train, or that you have reduced the nation's epic inequality to such a large degree? Lula:I think both. Obviously, for me, reducing social inequality was a life's dream that is coming true. The priority is looking after people. TIME: How do you define your economic model? The Third Way? Lula:No. I don't think we should look for a nomenclature for what's happening in Brazil. It's called doing things right  allowing the rich to earn money with their investments and allowing the poor to participate in economic growth. TIME: How do you see Brazil's new leadership role in the world today? Lula:In 2003, on the way back from [the World Economic Forum in] Davos, I told my Foreign Secretary that we needed to change the world's political and commercial geography a little... We proposed the creation of the G-20, which allowed [the Doha Rund of global trade talks] to be more than just something done by the Americans and Europeans. Another thing is the debate over the United Nations Security Council [where Brazil seeks a permanent seat]. It's not possible to run the U.N. the same way it was run when it was created. We have turned our attention more to South America. And I have visited Africa 19 times. TIME: What do you hope for from a new U.S. administration? Lula:I have told the U.S. President that it isn't prudent for the U.S. to be so rich and be surrounded by so many poor people. I hope the new U.S. President understands that with the end of the Cold War, there are only two things that can guarantee development in Latin America  democracy and peace  and in order to maintain them you need investment. TIME: How hard is it to mediate between George W. Bush and Hugo Chavez? Lula:It's not difficult. I once joked with that the fight between them is very weird because both of them are both so dependent on each other [because of oil]. I still believe that with a new government and a new policy and a new focus on a productive Latin America, the U.S. is going to have a good relationship with Venezuela, and vice versa. I think the [current] animosity doesn't necessarily have to carry on into the next American government. TIME: Is Brazil teaching Latin America a less divisive diplomatic model? Lula:I consider myself a negotiator. If we want peace and democracy we have to be tolerant, to negotiate more. On this continent, when [Bolivian President] Evo Morales tried hard to rival Brazil on the question of [gas] and a lot of people said I had to be tough with him, I said, No, has every right, the gas is his. My mother always said, two people can't fight if one person doesn't want to. TIME: Corruption-weary Brazilians hoped for a different way of doing things when they elected you, but scandals have marred your administration and the public bureaucracy is still one of the world's largest and most wasteful. Lula:This country has never adopted so many mechanisms to combat corruption as we have. [Today] almost all cases of corruption are a consequence of government investigations. But we haven't been able to carry out political reform yet; and a large part of the problems we have in Brazil are still a question of political reform. We've sent suggestions to [Congress]. But they are taking their time about it. All the officials [in Brazil's recent corruption cases] that had to be removed were removed. No one can accuse my government of not being transparent or not investigating. Nobody. But this isn't the fault of one government or one man, it's the fault of a [political] structure that has been there for centuries. And we are trying to dismantle it. TIME: Do you hope to be President again some day? Lula:I want to work to elect a successor who will continue all the work we're doing. If that successor does well, why would I want to come back instead of helping his or her re-election? Ex-Presidents have to keep quiet. TIME: Whom would you choose as your successor? Would it be a woman, such as your chief of staff, Dilma Rousseff? Lula:In truth, I already have a person I think it should be. It could be a woman.